Today Google announced a range of new updates for Search. More minor adjustments like sorting in Image Search and language additions for Google Goggles are all well and good (and useful) but there are three big changes coming to your search bar. Voice Search, Search by Image, and Instant Pages will be officially introduced to the Chrome browser shortly and give users ample new ways to find what they’re looking for. Google stressed today that its end game is focusing on the users, and that they’ve found this means faster, more accurate search results. These new additions are supposed to do just that, and have also drawn inspiration from–as well as will apply to–mobile browsing. We got a look at Voice Search for the desktop in March when Google showed off an early look at Chrome 11. The browser update included HTML 5 speech input support, meaning you could talk to your browser and get some answers. 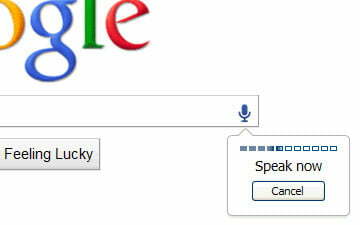 Today, Google introduced Voice search for queries via the desktop. It’s been available for mobile search and has made smartphone searching much easier (driving, on-the-go use, a personal annoyance for lengthy searches typed out on touchscreen…). But now, everyone gets to use it via Chrome. Google says that while the technology has been there for awhile, it’s been refined so that users don’t come up empty (very often). It now recognizes 230 billion (English) words, plus various dialects and accents shouldn’t be a problem. Get yourself the latest version of Chrome and a mic and you can forego the keyboard. Google Voice Search will be available to an upcoming version of Android on a Google TV in the future. Google can thank Facebook’s face recognition launch, and ensuing fallout, for the extra attention and cynicism for its Search by Image launch. Mobile also paved the way for Search by Image with Google Goggles. The new tool means you can now wordlessly search for what you want by uploading an image or using a picture’s URL (you can also simply drag these images to the search bar). There will be an extension for Chrome and Firefox that lets you right-click and search by image. Before you reference Facebook’s current imaging woes, here’s how Search by Image works: The technology behind the application is content agnostic, and all it’s doing is matching pixels from the linked or uploaded photo to those in its Image Search database. Google execs explain this means popular, well-documented images (i.e., the Eiffel Tower, the Statue of Liberty, Mount Everest) will yield more correct results. So if you upload a picture from a fairly well known hike you went on in Spain, the odds you’ll find similar images from that location are pretty good. If you upload a picture of your cat, it might not be as successful (unless of course you have a very famous cat or one that is well-represented on the Web). The addition will start rolling out globally this week, and you should soon see a camera icon next to your search bar. Google’s also outfitting its Image Search with Google Instant, so now photos will be getting the same sped up treatment your text queries did last fall. This will roll out over the next couple months. Google made it very clear today that all of its innovation is focused around speed. Execs said over and over again that any time they are able to shave milliseconds off of search speed times, more users appear and are happier with their experience. Of course, this made Google Instant a hit, taking off 2-5 seconds of search time. Now Instant Pages takes that final step and cuts down on page load time. The update readies the top search result (when it’s sure that’s what you’re looking for) in the background while you decide which link actually best suits your needs, saving what Google says is an additional 2-5 seconds. Google Instant brings up results as you type, and while you peruse the options, Google gets busy prerendering what it considers to be your best available result. When you click on it (we’d say if, but Google just sounds so sure it’s when), the page automatically loads with zero wait. The only hitch being that if you don’t feel terribly trustful or impressed by Google’s Search algorithm, the update won’t benefit you much. If you find yourself spending too much time toiling around page four or five of your Google Search looking for the source you want, then Instant Pages will be generally lost on you. But even the most obscure searchers out there occasionally need information that’s going to pop up on top, and in those situations once you click that link the page will automatically load and there will be no wait time. Sound familiar? Firefox’s prefetching feature has a lot in common with Instant Pages. Google’s product differs because it’s pre-rending the entire page: Ads, photos, style sheets, java script, etc. But how can Google be so confident the pages its spending precious bandwidth pre-rending are the right choices? Once again the Search giant falls back on its algorithms, saying it’s so secure in its relevance technology that it can determine in which situations the top result is most likely to be clicked, and in these instances it will work behind the scenes rendering the page while you browse the options. The whole idea is that Google is extremely certain it knows what result you’re going to choose. Web masters and developers will be able to tell when their pages are being prerendered using Chrome so they can use this information for analytics, Google says. You can start using Instant Pages by downloading the beta version of the new Chrome when it’s ready, or you can start today with the developers’ version.